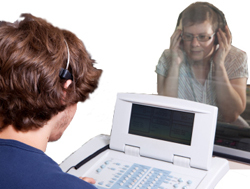 Free hearing tests! Come get diagnosed by a licensed specialist today. Florida Medical Hearing Centers is proud to provide free services to our communities across the state. Our licensed hearing aid specialists along with our state-of-the-art machinery will provide you with the most accurate diagnosis of your hearing loss. Truth is hearing loss is extremely difficult to self diagnose. Most people tend to think that hearing loss means everything gets quieter. But that isn’t necessarily true; in most cases patients with hearing loss can still hear, they just don’t hear clearly. Free hearing exams and consultations are risk free. Call us now to schedule an appointment at a clinic near you.